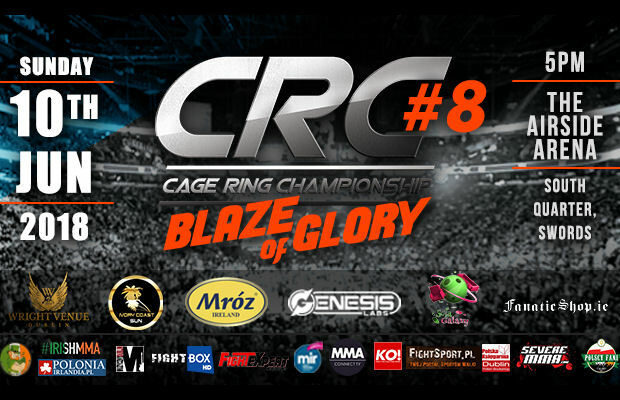 Cage Ring Championship 8: Blaze of Glory takes place this Sunday 10th June 2018 at The Wright Venue in Dublin, Ireland and sees Adam Caffrey take on Paweł Polityło for the Pro Bantamweight title in the main MMA bout of the night. Doors open at 4:30pm and the first fight is due to start at 5pm. 6) A/M MMA Weltherweight Nate Enright (SBG 24) Vs Eion Kelly (Fantom Team Dublin) – BRAKUJE ! !